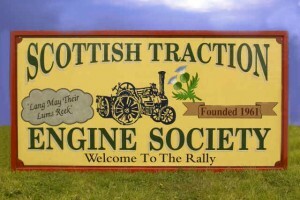 Membership grew steadily, including some with the past or present professional associations with the traction engines and their like: threshing and road contractors, drivers, locomotive men, steam engineers, modellers and so on, as well as those with a more general interest. A journal was published periodically, theoretically four times per year, to report developments and allow members to keep in touch. A priority in those days was to acquire engines for preservation. Those interested could acquire machines for ‘scrap’ prices, a situation which is far from the case today! Engines of various types were advertised as being available for sale in the columns of this and other journals, sometimes with the rider ‘no scrapmen’. Remarkable to relate from today’s standpoint, there was often no interest in these and some were eventually, like so many of their brethren, cut up. The first major event to be arranged by the society was the appearance of no less than eleven engines, many of them newly restored and painted, at the 1963 Royal Highland Show at Ingliston, near Edinburgh. This did not turn out to be an unqualified success, the weather was atrocious and considerable damage was done to the show-ring by the heavy machines. Roping had to be resorted to on occasion. Tempers sometimes became frayed! Engines in such numbers were never invited to a Royal Highland Show again, although a single machine was on display occasionally. It was to be five years later, in 1968, that the next major event to be organised took place. This was the first of the Hamilton rallies, held on the palace grounds. This continued until 1973, usually in co-operation with the Coltness car club. Unfortunately for the future here, developments relating to the new Strathclyde Country Park meant that the palace grounds could no longer be used. By this time society members hailed from the corners of Scotland and beyond. Kirkwall in the north, Lochboisdale in the west, Duns in the south, with a scattering from England and even abroad. In 1976 the society arranged a major event at the King’s Park in Stirling. A notable feature here was the appearance of five wagons (four Sentinels and one Foden) that were on a John O’Groats to Lands End road run. One problem with the park as a venue was that it was ‘public ground’ and visitors could refuse to pay entry if so minded. A number of rallies were held at the Auction Mart in Lanark, culminating in the 21st anniversary event in 1982. This proved to be a disaster financially as a result of poor weather on the Sunday and led to a policy of concentrating on smaller events where the cost would be kept down. In August 1986 the first Summerlee event was held at the then developing industrial museum at Coatbridge. This was a small-scale event, but proved extremely popular. A rally has been held at Summerlee every year since then, with usually some nine or ten engines in attendance. In recent years this has been the only reasonably sized event to be organised by the society. The last event being held here in 2004 due to a site refurbishment.